A group of kimono enthusiasts is trying to change people’s attitudes about the traditional attire by invading public spaces en masse. 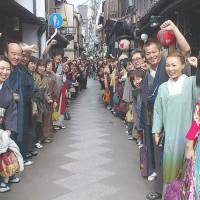 Kimono Jack — a group that takes its name from the Japanese tendency to use “hijack” when referring to flash mobs — calls on anyone with an interest to show up to its events in whatever kimono they have, free of the strict conventions and dress codes that dominate kimono etiquette in modern Japan. Founder Mihiro Akagi, 39, started the group in Kyoto in 2009 after being inspired by microblogging site Twitter’s power to coordinate flash mobs and other events. “I was inspired by an annual event where people ride the New York subway in their underwear, but I thought public (underpants events) wouldn’t go down so well in Japan,” Akagi said. 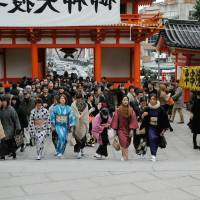 The 11 original members of Kimono Jack held an event at Yasaka Shrine in central Kyoto in which 40 people showed up in February 2010. Since then, groups have sprung up in 16 other cities, with participants recruited via Twitter and Facebook. “People can turn up whenever they like, so the numbers differ each time, but events in Kyoto or the big cities of Tokyo and Nagoya consistently attract 100 to 180 people,” Akagi said. Participants range widely in age and sometimes include parents with children wearing matching outfits. Tokyo Kimono Jack leader Hiroyuki Morikawa, 35, makes kimono at a workshop and sells them at a retail shop he manages in central Tokyo’s Roppongi district. He says each event in the capital draws in 20 or so newcomers in addition to the regulars. There are Kimono Jack offshoots in many other places around the world, with members buying primarily secondhand kimono from online shops and on trips to Japan. The Australian, British and Dutch groups are the most active and have conducted “jacks” of popular sightseeing spots. The organizers say Kimono Jack has given them valuable connections with kimono enthusiasts from around the world. “There are always some foreigners in kimono at our events in Japan, and they seem to show a particular interest in the dyeing and weaving technology behind the kimono,” Akagi said. “I find that non-Japanese people judge a kimono on its own merits rather than grading the wearer on how they’ve stuck to the rules,” said Morikawa. “If more Japanese people thought like that, I think the number of kimono converts would grow,” he added. Akagi said the establishment of Kimono Jack circles in other countries fills him with joy. He hopes that one day he will be able to host a “World Kimono Jack” event. “I love looking at the photos that the overseas groups post on Facebook, and it’s particularly heartening to see people get more and more confident in wearing kimono from one event to the next,” he said. 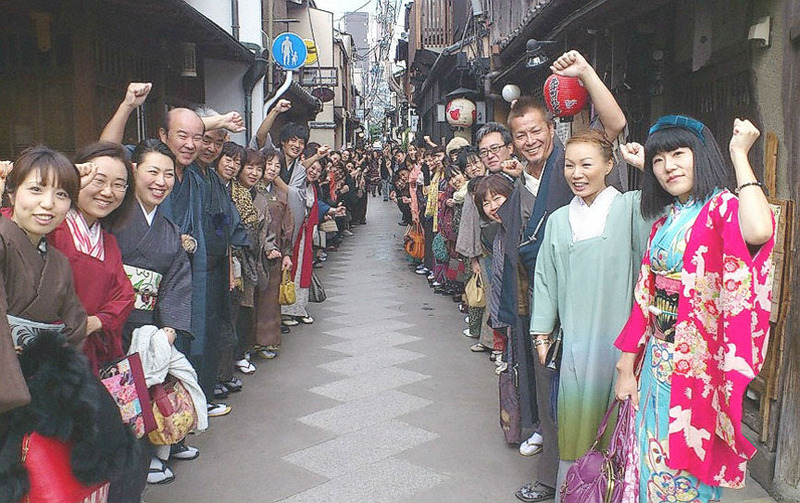 In Kyoto, a center of textile production famous for its carefully preserved heritage sites, lone kimono wearers are not unusual, but a group of over 100 walking down the street attracts plenty of stares and smiles, Akagi said. “Passers-by always take lots of pictures of us, which we encourage, and ask questions about our kimono. “I feel we’re doing something right when people tell us ‘I want to wear kimono now, too,’ ” he said. Akagi and Morikawa agree that kimono culture must be revitalized if it is to be passed on to future generations. Whereas kimono were once everyday wear and an expression of one’s fashion sense, they are now rarely seen outside of special events, such as weddings and coming-of-age ceremonies. This association with formality has tightened the rules and conventions involved, putting many Japanese off wearing kimono casually for fear of making a sartorial mistake. Dressing oneself can be challenging for beginners. An obi that looks held in place by a single jaunty knot typically requires a number of supporting accessories hidden underneath to keep it in place. “Today’s Japanese people are always running here and there, and kimono hardly lend themselves to running, and they take longer to put on than Western clothes,” Akagi said. Kimono are often made with artisanal techniques and so command a high price. The requirement that the color, fabric and motifs of kimono ensembles match the seasons, entailing a large inventory of accessories, can also be off-putting. “It was our parents’ generation that stopped wearing kimono regularly, and young people interested in kimono tend to be inspired by their grandparents rather than their parents,” Akagi said. “From now on it’s important that we dress our kids in kimono when we get the chance, as well as wearing them ourselves,” he added. People in the kimono industry and connoisseurs alike are taking initiatives to make kimono more accessible, be it through price, materials, design or the way they are worn, Akagi said. Restaurants, museums and taxi companies in the city of Kyoto offer discounts for customers in kimono, and magazines have begun featuring kimono with quirky motifs or paired with nontraditional accessories like hats. Retailers could also reach a new generation of wearers by adjusting their sales pitch, Morikawa said. “When people go to buy kimono, they typically get hit with an explanation of the painstaking work that went into the garment to justify its price,” he said. “Sure, kimono are a little more challenging than Western clothes in terms of both time and money, but they offer just as much of a chance to show one’s individual style and this should be emphasized to customers,” he added. Kimono are a valuable part of Japan’s cultural heritage, but “perhaps rather than weighing them down with heavy words like ‘culture’ and ‘tradition’ we should explore how fun they are to wear, and hopefully Kimono Jack can help with that,” Morikawa said. 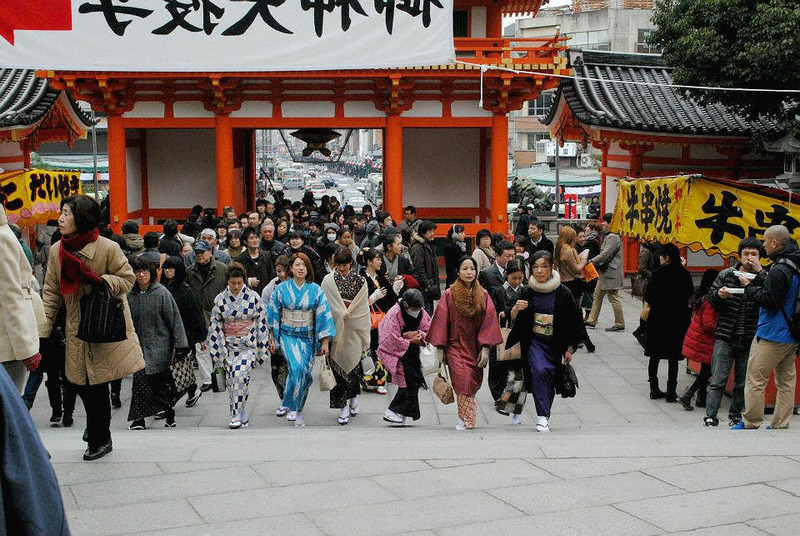 The next Kyoto Kimono Jack will be held Sunday at Yasaka Shrine. The next Tokyo Jack will be at Tokyo Tower on Jan. 26. Registration is not required.